The need to communicate between peoples speaking different languages requires more language professionals. Translators’ training is, consequently, central in research and curriculum design.Moreover, it is gradually changing to encompass aspects of life that were not considered beforehand. It is turning into a perfect ‘place’ to raise trainees’ awareness, especially when specific matters, such as gender-related issues, are tackled. Hence, training translators can be considered an ethical social action, since it may turn the trainees into better equipped citizens. It concerns more the trainees as individuals and relates to their personal reliability more than their linguistic skills. 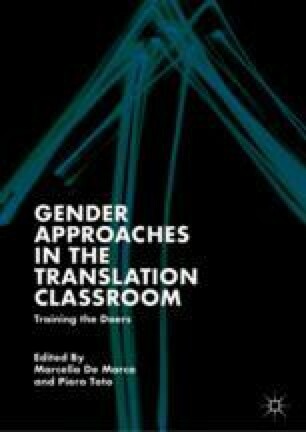 This paper investigates how the classroom becomes an awareness-raising place, and how trainees are ‘forced’ to refer to reflections and cognition in order to solve translational problems that are otherwise considered merely linguistic. A framework of analysis that combines Critical Discourse Analysis (CDA) and Cognitive Linguistics (CL) is employed and discussed. Lawrence, Anthony. 2014. AntConc (Version 3.4.3) [Computer Software]. Tokyo: Waseda University. Available at http://www.laurenceanthony.net/. Shlesinger, Miriam. 2000. Interpreting as a Cognitive Process: How Can We Know What Really Happens? In Tapping and Mapping the Processes of Translating and Interpreting, ed. Sonja Tirkkonen-Condit and Rita Jääskeläinen, 3–16. Amsterdam: John Benjamins. https://doi.org/10.1002/9781405198431.wbeal0145.